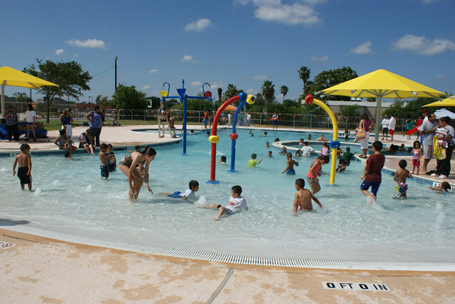 May 2012 marked the grand opening and dedication of the all-new H-E-B Pool. The original pool on this site was closed for public use in 2009 during which time the facility underwent a complete replacement to include a new leisure pool and sprayground. This $2.1 million improvement project was funded with a voter-approved bond in 2008. Other renovations for the facility include the pool bathhouse, concession areas and party areas. Six new cabanas were also added as well as a second building to house staff offices and new mechanical equipment.